Bungee jumping became popular in the early 1980s. Owing to the prevailing professionalism in the field, accidents are extremely rare. However, occasional medical complications do occur. They are mostly ophthalmologic, but spinal and vascular lesions have been reported . Respiratory complications have also been described (one case of pulmonary haemorrhage  and one case of bilateral pneumothoraces in a patient at risk ). 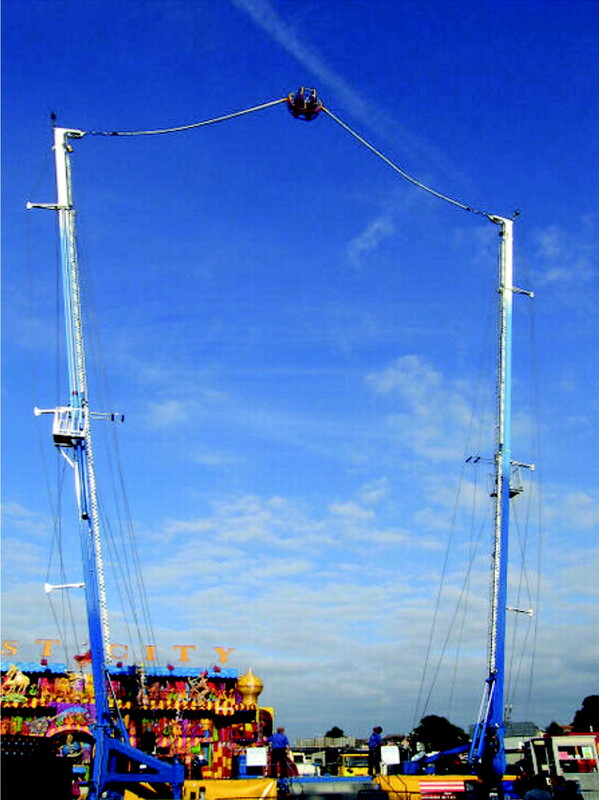 Reverse bungee jumping is an increasingly widespread fairground attraction during which a one- or two-person passenger cradle is hurled vertically up to 80 m into the air by the sudden release of previously stretched elastic ropes (fig. 1). Exceptional accidents have been reported (one case of subdural haematoma  and one case of pneumothorax ). We describe a case of acute hemidiaphragmatic elevation with diaphragm weakness possibly linked to this activity. A typical reverse bungee jump attraction. Image courtesy of Andrew Dunn. A 52-yr-old office worker (175 cm; 97 kg; body mass index 31.7 kg·m−2) was referred to our outpatient clinic in May 2006 to investigate recent-onset exercise dyspnoea (self-characterised as “hindering usual acrobatic dance performances”). The patient also reported mild orthopnoea. He did not smoke and had no history of chronic disease, previous surgery or traumatism. Clinical examination was unremarkable. Chest radiography showed an elevated right hemidiaphragm (fig. 2a) capped by passive atelectasis. Thoracic computed tomography did not show other abnormalities. Blood chemistry and blood cell counts were normal. Vital capacity was 87% predicted, falling to 73% pred in the supine position. Sniff nasal inspiratory pressure was 57% pred (64 cmH2O). Cervical magnetic stimulation of the phrenic nerves showed electromyographic responses with normal latencies on both sides (right: 6 ms; left: 6.3 ms; expected values between 5.5 and 6.5 ms) but diminished amplitude on the right side (right-to-left ratio 0.5). The corresponding diaphragm twitch oesophageal pressure was low, at 4.7 cmH2O (expected value >11 cmH2O), and so was the twitch transdiaphragmatic pressure, at 10.9 cmH2O (expected value >20 cmH2O). Thoracic computed tomography showed the absence of diaphragmatic rupture (fig. 2b). Notably, it also showed multiple images suggestive of hepatic haemangiomas, the largest of which was 11 cm in diameter. There was no history of shoulder pain, no electromyographic abnormalities in the shoulder muscles and no signs of cervical arthrosis on cervical radiography. A diagnosis of diaphragmatic “eventration” without phrenic nerve lesion was made. Further discussion with the patient revealed that he was able to pin-point the beginning of his respiratory problems. He dated them from a day spent in a theme park a few weeks before, and clearly remembered having felt most unwell, with abdominal pain and a feeling of suffocation, immediately after a reverse bungee jump. We explained to the patient that a diaphragm plication could alleviate his symptoms, but that delayed recovery was not impossible . He chose not have surgery. Over the next 18 months, the symptoms progressively receded, the patient finally reporting being back to his initial form. Repeated pulmonary function tests showed a recovery of vital capacity (91% pred in October 2007, with no supine fall). Chest radiography showed a progressive return of the right hemidiaphragm to a roughly normal position (fig. 2c). The patient declined repeated phrenic stimulation. He was lost to follow-up after October 2007. The patient had been informed at the time of initial investigations that his data could be used for scientific purposes and had agreed to this in writing. a) Initial chest radiograph, taken on May 11, 2005. b) Coronal computed tomography image contemporary with the initial investigations; note the presence of a hepatic mass, classified as one of several probable haemangiomas after contrast imaging and ultrasounds. c) Follow-up chest radiograph taken on October 2, 2007, at a time when the patient no longer complained of dyspnoea; the right hemidiaphragm is still slightly elevated, but recovery has clearly occurred. Medical complications from roller coasters and other funfair attractions are exceedingly rare. However, submitting large populations of untrained and unselected persons to violent physical constraints is bound to reveal otherwise silent abnormalities, hence the importance of cautionary notices warning people with or at risk of specified medical conditions. It is also important to identify and describe proven or strongly suspected complications for future reference. In our patient, one possible mechanism to explain the unilateral hemidiaphragm elevation would be a phrenic nerve stretch lesion resulting from a sudden neck movement. Such lesions have been described after chiropractic manipulation of the neck or as a result of “whiplash” in the context of a motorcycle accident . One then expects the diaphragm response to phrenic nerve stimulation, if not abolished, to be both attenuated and delayed . This was not the case in our patient, where phrenic nerve conduction times were normal and symmetrical, in spite of the reduced amplitude of the motor response on the affected side. This amplitude reduction could correspond to moderate axonal loss, but could simply have been due to the hemidiaphragm elevation modifying the spatial relationship between the muscle and the electrodes. Notably, a partial phrenic lesion would easily explain the observed recovery . Another possible mechanism to consider would be a diaphragmatic, rather than phrenic, lesion. Transient upward accelerations have an inspiratory effect on the chest wall, whereas downward accelerations are expiratory . Therefore, during a reverse bungee jump, the respiratory system will be exposed to a brutal shift from an ascent-related inspiratory force, which can reach 4–5×g, to a descent-related expiratory force, the abdominal content being suddenly “projected” in the cephalad direction at the moment of the trajectory reversal. Given the dome-shaped nature of the diaphragm, the corresponding force will be applied uniformly and perpendicularly to all its surfaces if the abdominal content behaves like a Newtonian incompressible fluid, which is a reasonable assumption. Even in the presence of very severe constraints, this should prevent diaphragm damage, as in the case of an egg not cracking when exposed uniformly to extreme pressures. This hypothesis is consistent with the fact that thousands of bungee or reverse bungee jumps, funfair elevator rides, centrifuges, or similar challenges occur daily without causing an epidemic of diaphragm eventrations, and also more generally with the fact that the diaphragm does resist extremely high and sustained abdominal pressures during labour. However, submitted to pressure, an egg breaks if there is a regional weakening of its shell or if the pressure distribution becomes nonuniform. Diaphragmatic rupture in response to a major increase in abdominal pressure could thus reveal a previously unknown diaphragm defect, a mechanism that has been proposed to explain the exceptional occurrences of labour-related diaphragm ruptures [9, 10]. The diaphragm can also give way to a nonuniform rise in abdominal pressure, as in the case of near-side motor vehicle accidents . In our patient, the heterogeneous nature of the haemangiomatous liver could have been responsible for such a mechanism. Of note, no diaphragm rupture was documented. Diaphragmatic “elongation” (strain- or sprain-like) was thus more likely and would also be consistent with the observed spontaneous recovery. Whichever of the suspected mechanisms was actually involved, this observation is a reminder that it is important to look carefully for both cervical and abdominothoracic traumatisms, even in the distant past, when investigating the nature of a hemidiaphragm elevation. The study was supported by Association pour le De´veloppement et l’Organisation de la Recherche en Pneumologie (Paris, France).
. Traumatic carotid artery dissection caused by bungee jumping. J Vasc Surg 2007; 46: 1044–1046.
. Pulmonary hemorrhage resulting from bungee jumping. J Thorac Imaging 2007; 22: 358–359.
. Bilateral pneumothoraces following a bungee jump in a patient with cystic fibrosis. Respiration 2006; 73: 113.
. A subdural haematoma following “reverse” bungee jumping. Br J Neurosurg 2002; 16: 307–308.
. Pneumothorax efter “omvendt bungee jump”. [Pneumothorax after “reversed” bungee jump.]. Ugeskr Laeger 1999; 161: 5547–5548.
. Functional recovery of diaphragm paralysis: a long-term follow-up study. Respir Med 2008; 102: 690–698.
. Diaphragmatic paralysis following minor cervical trauma. Muscle Nerve 2007; 36: 267–270.
. Respiratory effects of transient axial acceleration. J Appl Physiol 2001; 90: 2141–2150.
. “Spontaneous” rupture of the diaphragm during delivery. Br J Surg 1973; 60: 666–668.
. Diaphragmatic rupture complicating labor. Ann Emerg Med 1996; 27: 522–524.
. The association between body mass index and diaphragm injury among motor vehicle collision occupants. J Trauma 2004; 57: 1324–1328.